The Wood Lake Battlefield Preservation Association began on January 6, 2006, when nine people, who were concerned with the preservation of the Wood Lake Battlefield site, decided to join together to try to bring public awareness and interest to this mostly privately owned Minnesota historic site. This grassroots association has grown steadily since its conception and currently has over 1060 members from 35 states. The Wood Lake Battlefield is one of two Minnesota sites that are recognized as Civil War Sites. The Civil War Sites Advisory Commission (SWSAC) determined in 1993 that the Great Sioux Uprising of 1862-1864 was of national significance. And out of 10,500 evaluated national sites, two in Minnesota, Fort Ridgely and Wood Lake Battlefield, were included in the final list of 384. This being due to site integrity and the nationally significant events associated with the Civil War, western expansion and the government’s Indian policy. On July 30, 2010, the National Park Service awarded the Wood Lake Battlefield to be listed in The National Register of Historic Places. The Association is working closely with land owners, the Civil War Trust (CWT), The American Battlefield Protection Program (ABPP) of the National Park Service, Minnesota Historical Society (MHS) and the State Historic Preservation Office (SHPO) in order to secure conservation easements on a major portion of the battlefield. Funding for this project has been raised through individual memberships to the association, private donations and grants from the Civil War Trust, American Battlefield Protection Program, and The Carl and Verna Schmidt Foundation. The ravine area of the battlefield is available for self-guided tours for all people to interpret according to their own study of what happened at the site in 1862. Visitors will be able to experience first hand the special feeling that many feel when they walk in the pasture…land that has never been cultivated and has endured the last 150 years with little change. 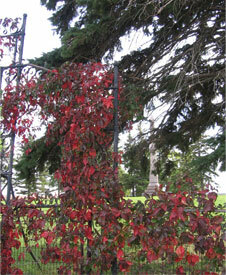 Please note the Battle site is closed to the public each year from October 1 to December 31. The Association brochure is available at the Upper Sioux Agency Interpretive Center, County Historical Societies (Brown, Chippewa, Nicollet, Redwood, Renville, and Yellow Medicine), Minnesota Historical Society (MHS) or by contacting the Wood Lake Battlefield Preservation Association at woodlakebattlefield@yahoo.com. We have received approval from the American Battlefield Protection Program (ABPP) for proceeding with the Thomason & Associate professional plan for interpreting and developing the battlefield in increments of 5, 10 and long range years. The association is working on developing paths, points of interpretation and signage. Yellow Medicine County continues to improve the pull off at the battle site. 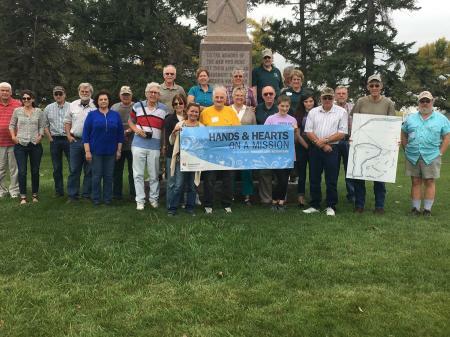 The Association is working on co-coordinating signage for the monument site and battle site. A rack card will be available at MHS in St. Paul and historical sites along the Minnesota River to help our visitors find and interpret both the monument and battle site. The Association is supported by Organization Partners who recognize the valuable effort of promoting history and the preservation of historical sites.